Mongrace comes to New Town with the long experience and reputation of an institution where every child is special. With a low teacher & auxiliary staff children ratio, there is a continuous monitoring of each child and regular parent-teacher-principal interactions. 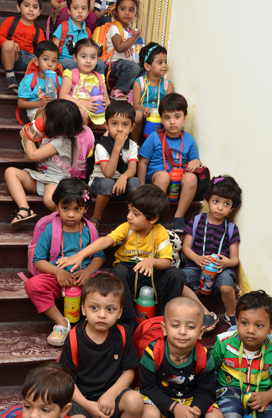 The Day Care Centre is a home away from home for the children. It has been designed keeping in mind their special requirements. They are looked after by trained auxiliary staff and guided by experienced teachers in their daily activities. They are also provided with wholesome food (lunch & snacks). Lunch facility for children is available between the age of 1 year 10 months and 8 years (5 days a week). The menu has been decided upon in consultation with a dietician. At Mongrace Day Care Centre, we provide a nurturing, happy environment for the children and develop age appropriate programmes that challenge them and allow for personal growth and development. We help the children become independent, while also learning about teamwork. During Vacations we have a variety of activities to engage the children. "Mongrace Montessori House was established in 1964"